Bonito, Cutter, 7 tons. Viscount Bangor. Viscount Bangor was born in 1828, and educated at Rugby. 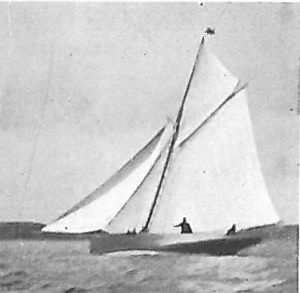 The Bonito, his first yacht (designed by the late Right Hon. Edward Saunderson, M.P. ), was built in 1884 at Castle Ward, which he owns at the present time. She has figured very largely in racing about Belfast Lough and Strangford Lough, and met with considerable success, though there never was any very strong class for yachts of this size in the North of Ireland. Clubs: Royal St. George’s and Royal Ulster. Residence: Castle Ward, Downpatrick, Down, Ireland.